In March 1964, Stanley Kubrick decided that his next project would be to make “the proverbial good science-fiction movie.”Fifty years after the film’s conception, TASCHEN looks back at the process of making the most important science-fiction film of all time. Though 2001 has arguably spawned more critical texts and scholarly analyses than any other film, this publication marks the first time that a truly exhaustive book has been devoted to it. TASCHEN readers enjoyed a sampling of previously unseen 2001 material in The Stanley Kubrick Archives; this four-volume set revisits the subject, exploring in great depth every aspect of the film and its making: the groundbreaking technical effects, the extraordinary set designs, and the fascinating collaboration between Kubrick and Arthur C. Clarke. Made in exclusive collaboration with the Kubrick estate and Warner Bros., this copiously illustrated work features hundreds of unique 2001-related documents, concept artworks, and superb behind-the-scenes photographs from the Kubrick Archives—most of which have never been published before—as well as exclusive correspondence and personal testimony from Kubrick's co-screenwriter Arthur C. Clarke. 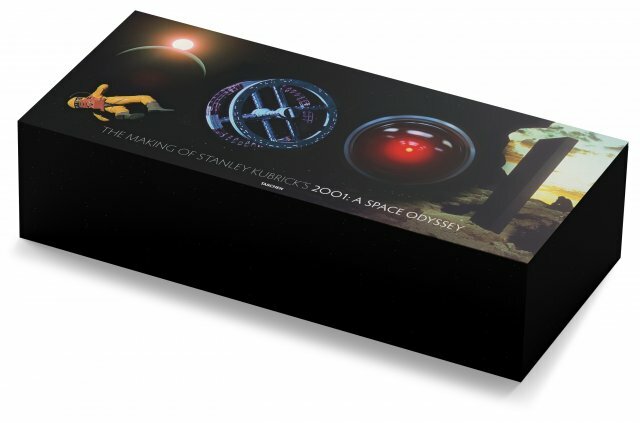 The Making of Stanley Kubrick’s "2001: A Space Odyssey" is a landmark book for film fans and a celebration of technical special-effects innovation before the digital age, conceived by the very designers of TASCHEN’s instant collectible Stanley Kubrick’s Napoleon: The Greatest Movie Never Made. are trademarks of and © Turner Entertainment Co.
Piers Bizony has written about science and the history of technology for a wide variety of publishers in the UK and the US. A recent project, Atom, a book linked with a major BBC TV series, told the dramatic story of the rivalries and passions behind the discovery of quantum physics. The Man Who Ran the Moon picked up rave reviews for its account of NASA's lunar-era chief administrator, Jim Webb, and Starman, a gripping biography of Yuri Gagarin (co-authored with Jamie Doran) was optioned earlier this year. A feature film is being planned. His text for The Making of Stanley Kubrick’s '2001: A Space Odyssey' is a much extended and updated version of his bestselling 1994 monograph 2001: Filming the Future. Established in Paris in 1992, M/M (Paris) is an art and design partnership consisting of Mathias Augustyniak and Michael Amzalag. They are best known for their art direction and collaborations with musicians, fashion designers, and contemporary artists, including Björk, Madonna, Yohji Yamamoto, Balenciaga, Pierre Huyghe, and Inez van Lamsweerde & Vinoodh Matadin, as well as magazines including Vogue Paris, Interview, and Purple Fashion. In addition to solo shows in galleries in Europe and Japan, they have participated in exhibitions at Centre Pompidou and Guggenheim New York, and their work is featured in public collections around the world. make sure to watch the video on that link.